No matter what you’re selling there is a step-by-step process that takes place from initial contact to completed install. Each step in the process presents an area where you can be losing prospects who are ready and willing to pay you, but unfortunately you haven’t done the best job of helping them learn that! And each of those areas can potentially be improved for each step in your sales process… So if you’re sales process has 6 steps, then there are possibly 18 different areas you can improve. If that doesn’t make sense, don’t stop reading yet! the ONLY way to determine your weak areas AND make an educated decision on how to improve them is through detailed tracking for at least 2-4 weeks. Ultimately you should be tracking every lead with this level of detail FOREVER to make sure no weak-links pop-up down the road. So here’s my 8 step process for plugging those holes and increasing your closing ratios to the best they’ve ever been in the next 30 days. Confirm: X was here yesterday and we’re going to go with them, Too expensive, An emergency came up, We’ll be home and waiting! Appointment: Too expensive, Have to ask my spouse/mom/dog, Think we’re just going to go with X instead, I don’t think we need that right now, Sounds great sign me up. Follow-up: Credit was turned down, Sign us up!, Check Bounced, Credit Card denied, We changed our mind. 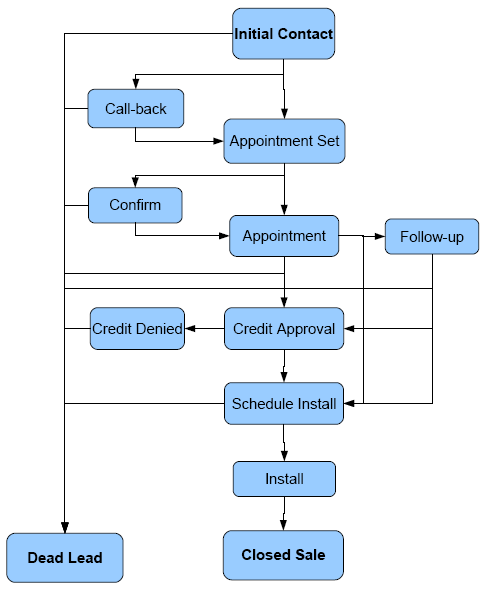 Schedule Install: If you are losing leads at this step, look at the time from the previous step to the install date. You may need to look at working non-standard hours to get installs taken care of right away. Did that lead source pay for itself with after sale profits? Are	there any steps in our sales process where we’re losing a lot of people from this source? If they’re no longer interested, WHY NOT? If you believe you have a great product that you KNOW will help them you should be shocked that they’re no longer interested and ask. Analyze the data. Determine the weak step (i.e. from step #1). You determine the weak step by looking at the step prior to it becoming a “Dead Lead.” For instance, if after the initial “Call-back” they say they’re not interested, your weak step was the “Initial Contact” and/or the “Call back”. Now to determine the weak link (script, person, system) you have to look at the REASON they became a dead lead. Not Interested will never tell you the weak link! Too expensive, husband says our water is fine, we already bought from X competitor, are reasons that allow you to start addressing the weak link. Obviously, you also need to record which person handled the “Initial Contact” and which person handled the “Call-back” to determine if it’s a people-problem. Plug the hole. Improve the weak link. How do you do that? Simple. You make a change, test it for the next few weeks and measure the results. Be careful to only make ONE CHANGE AT A TIME PER STEP or else you won’t know which change made the difference. Your change may be additional training for the person, improvements to the script, or a better method for tracking follow-up within your sales process. Rinse and Repeat. Once you stop tracking each lead your closing ratio starts to go down immediately.